I would like to wish my readers a Merry Christmas! I am sure that you have opened your Christmas presents and smiling over your latest gifts. 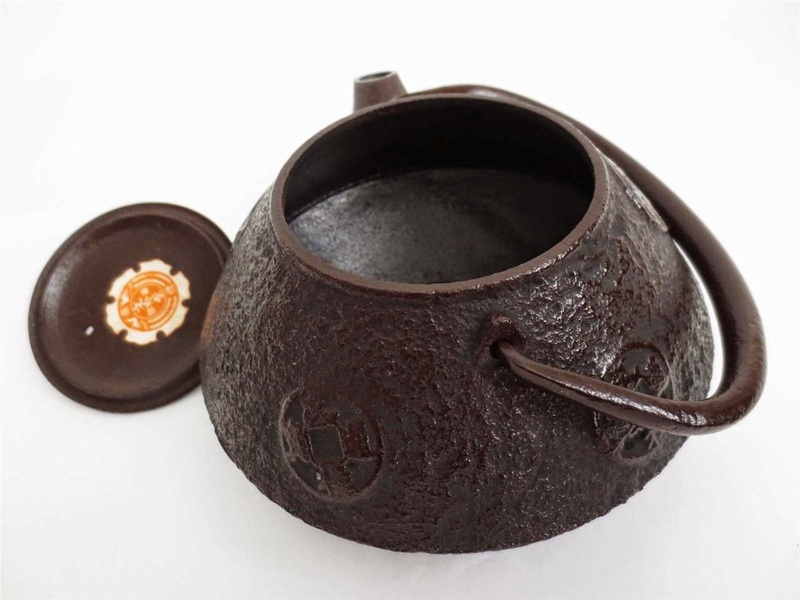 I bought myself an Nambu Tekki tetsubin kettle for myself. Come to think of it, I am have been too generous in gifting presents to myself. This is the famous Japanese tetsubin produced under the "Nambu Tekki" brand. The sticker on the underside of the lid as well as the mold brand on the kettle will help buyers determine the authencity of this Nambu kettle. 'Nambu' literally means south region. 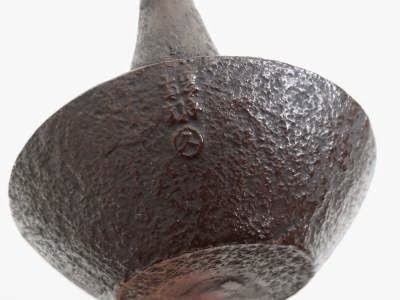 Nambu iron ware are produced in the Iwate prefecture in Japan. 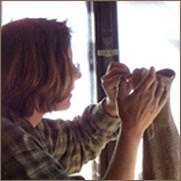 Such iron ware are very popular in Japan and now abroad, due to the traditional hand making techniques used to make such wares. The kettle I purchased is a smaller version compared to my previous tetsubin purchases (link). This newest purchase can hold about 350-400ml of water. I intend to use it for brewing tea in smaller teapots. 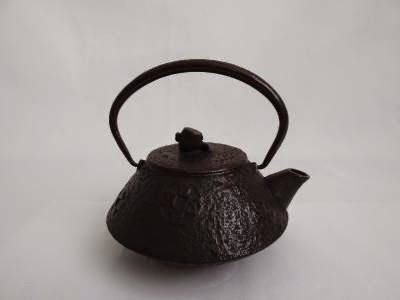 I like to warn readers that if you are intending to use or buy a tetsubin kettle, you have to really take good care of it as it may gather rust if not dried out properly after use. I had purchased a much bigger tetsubin but I have rust issues with it. I would appreciate if there are any readers out there that can suggest ways to help me resolve my slightly rusty tetsubin. 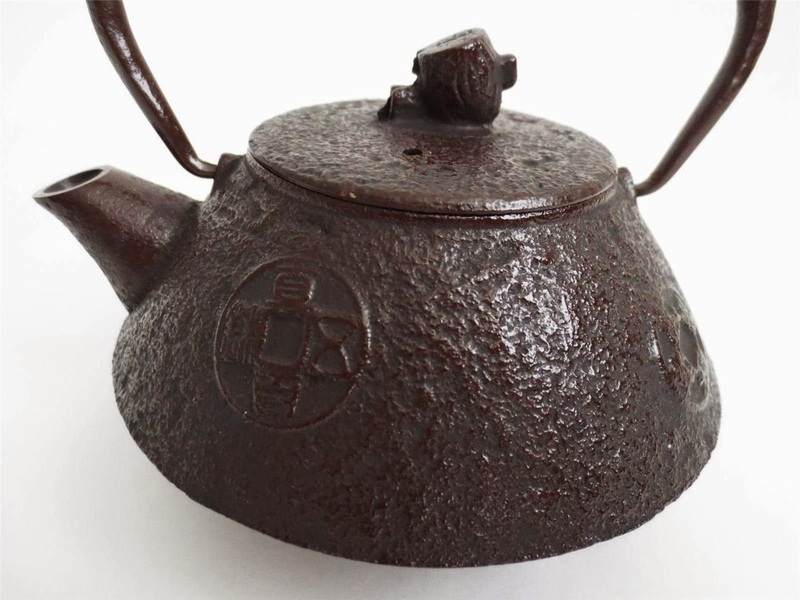 Why a tetsubin kettle? Many serious tea drinkers I know attest to the softness of the water when the water is boiled in a tetsubin. I do think (hopefully not imagining) that I detected the water taste a wee bit different. Aesthetically, having a tetsubin in a tea brewing setup is very pleasing to the eye and it does make a tea session more elaborated than it seems. I was at the tea expo in Kuala Lumpur, Malaysia over the weekend. This tea expo was held at Viva Home Mall. I wanted to refill my stash of liu bao tea and wanted to see what oolong the tea expo had to offer. It was interesting that this tea expo had most of the stalls promoting pu erh tea than other teas like oolong or liu bao. Pu erh tea here takes centre stage as many Malaysians do drink and invest in pu erh. Investment here would mean that tea collectors would purchase pu erh in quantities, like buying them in cartons and storing these tea for a few years and reselling these tea when the prices have increased. 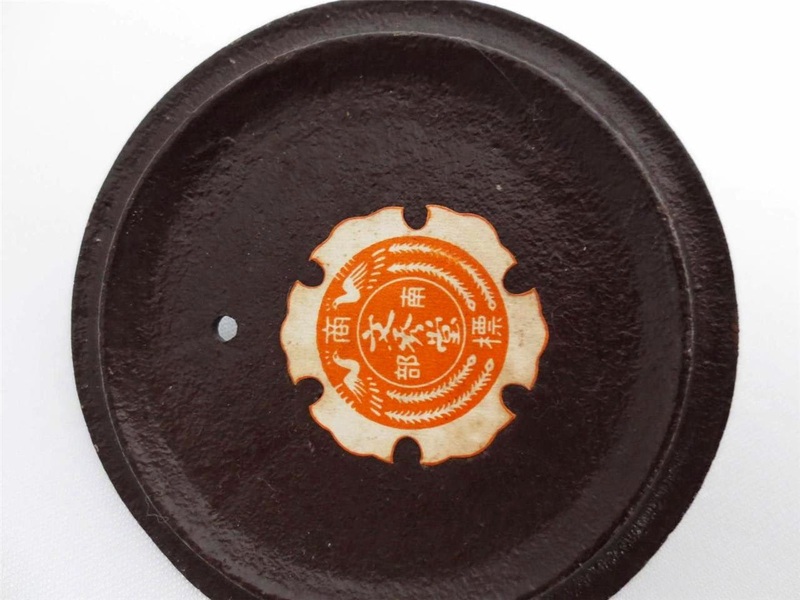 Taetea (Dayi) brand is an investment favorite among tea collectors. 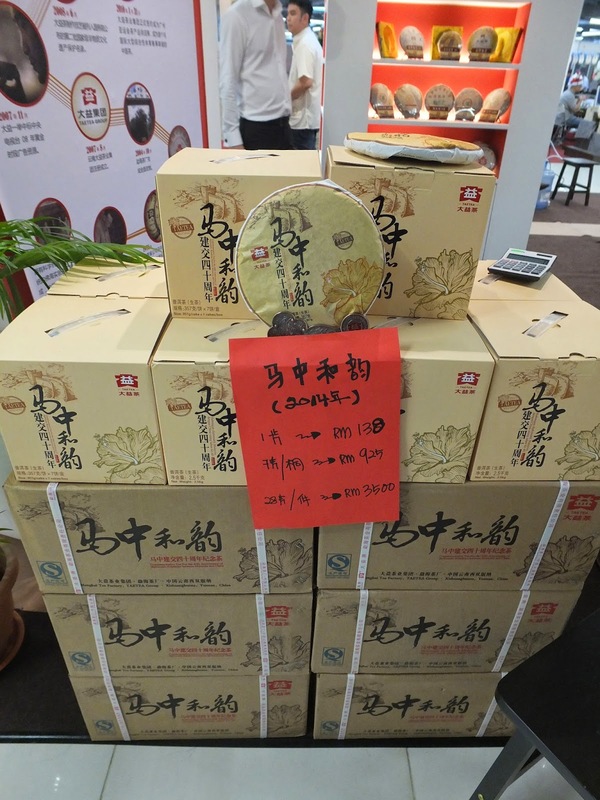 The highlight of this year's tea expo, to me, was the 2014 Dayi 40th anniversary "Malaysia-China collaboration" pu erh tea cake (pix 4&5). 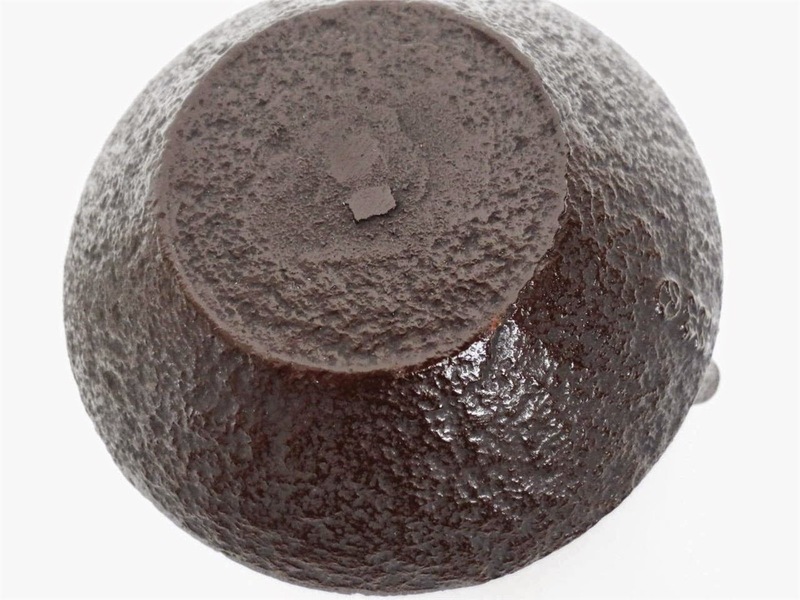 This pu erh tea cake's recipe is created from feedback of the Malaysian tea drinking community. This cake is smokey. And yes....most of this tea will not be drank but stored away as an investment item. Pix 3 is the pu erh tea group I meet when I am in Kuala Lumpur. I am especially grateful to James Ong (pix 3 , standing in a red polo shirt) who spent considerable time with me updating me on the trends in pu erh tea as well as the new finds of pu erh tea that met the high drinking standards of this tea group. Thank you very much, James! While I was disappointed that I did not get to purchase any older oolongs at the fair, I did buy some pu erh tea and a couple of teapots (more in my later blogs). 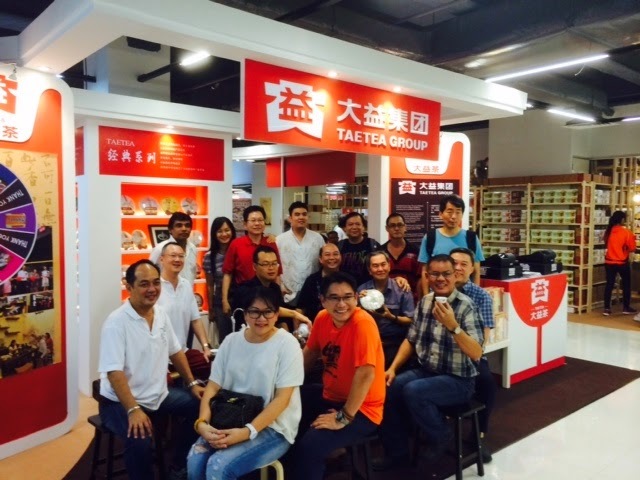 A memorable trip and I was most happy when I am drinking tea with my Kuala Lumpur tea group. Yes....I got myself another tea table. Readers will know that I had already a few tea brewing tables and this new addition arrived last week. Why so many tea tables? I don't know....maybe open a tea nightclub or something. This large circular tea table measured 18 inches or 46cm across and arrived well packed in a huge carton box all the way from Czech Republic. Made by Keramikstudio and owned by Petr Novak and his partner Miroslava Randova, this handcrafted woodfired tea table simply captured my imagination that I was willing to shell out US$205 (inclusive of air freight) to get it. This tea table is made up of 3 parts. The table top, a large deep circular bowl and a removable trivet. The trivet as you will notice, is a 3 legged support that when placed in the tea bowl, will hold up and support the table top. The trivet also act to keep the table top dry during a tea brewing session. This tea table set is very sturdy and heavy as well. The only setback is pouring out the discarded tea after a tea session, which needed me to be more careful and deliberate due to the weight of the tea bowl. I purchased this tea table for a number of reasons. One is that the design is simple but elegant. These guys from Kermikstudio had captured the essence of a Chinese tea brewing table, that is being simple and functional. I just add in a teapot and a few cups to start a tea session. Nothing fancy...just simple. And...this tea table is made by a European couple all the way in Czech Republic. It is my opinion that this table is nicer than most fancy tea tables I had seen in the tea markets in China. Time for a group photograph of my family of tea tables. I was told that this tinned Butterfly brand Tieh Kuan Yin (aka tgy) was considered as one of the expensive tinned tgy. Retailing for about $30 or US$25, you get 250g worth of tgy sealed in a aluminum foiled bag and packed in a tall metal tin to ensure the tea leaves do not get broken till sold. I am starting to drink and explore the world of oolong and went recently on an oolong shopping day. I am unable to resuscitate my wallet after my oolong purchase. I can understand now why serious oolong drinkers use small teapots to brew their tea.....its so darn expensive! I used smaller teapots to brew my oolongs. For pu erh...I use 150-220ml teapots, but for oolongs I use about 100ml sized teapots. I find that brewing oolong in in a smaller teapot is ideal for me as I drink oolong on the strong side and 6 good infusions of oolong is enough oomph for a tea session. I normally fill about 1/4 of the teapot with oolong and let the hot water infuse for about 15-20 seconds before pouring out the tea. When I end my tea session, the teapot will looked stuffed full of the hydrated tea leaves....literally to the brim. Back to this tgy. This tea is a medium roast tea, but on the heavier side. If I use a scale to measure the roast levels of a tea....0-35 is light, 35-70 is medium while 70+ is heavy roast. I would rate this tea with roast levels at 65 - 68. This tea exhibits a nice floral bouquet aroma with a mild hint of a sweet finish. I personally prefer the heavier roasted tgy but overall impressions of this medium roast tea are very good. This tea makes a very nice chilled tgy too. One more thing...if you are using a yixing teapot to brew your oolong, use the teapot only for oolongs as the aroma does sometimes linger for some time after washing the teapot and may affect your tea session is you use the same teapot for other non oolong tea.